MARS Bites Coupon | A Savings WOW! Love Chocolate? 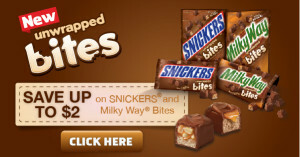 Get a $2 Off SNICKERS or Milky Way Bites Coupon! I’m a chocholic, so having these bite-sized morsels makes it handy to have chocolate in my purse for a quick pick-me-up during the day! How about you? What’s your favorite thing about these SNICKERS(r) and Milky Way(r) Bites?